Welcome back everyone! The new release from MFT is now LIVE and I am so excited to be sharing some inspiration for you and guest designing with them this month! 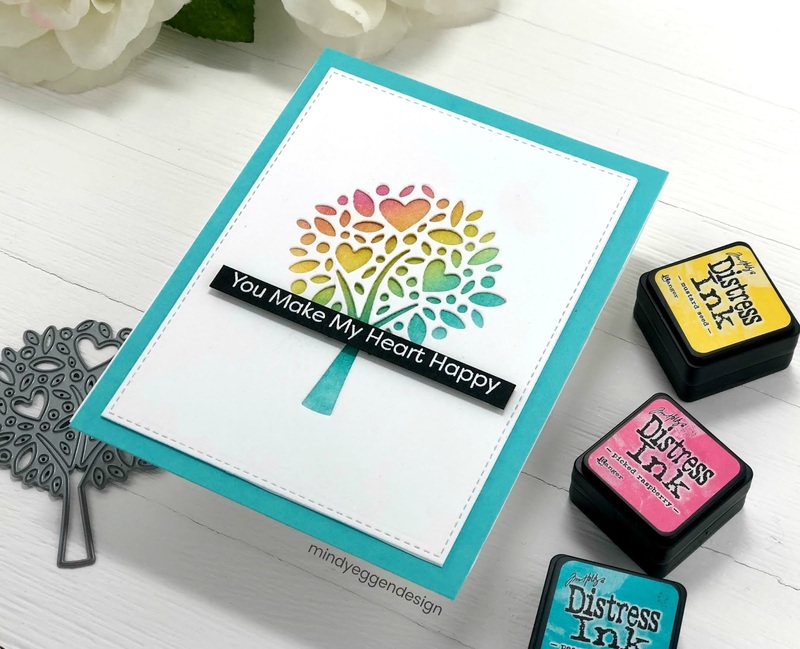 My first card is featuring the Heart Tree Die-namics. I die cut the Heart Tree from the center of a piece of Neenah Solar white cardstock. Then die cut with Blueprint 29 for the stitched edge. I ink blended Picked Raspberry, Mustard Seed and Broken China Distress Ink on a separate piece of Bristol Smooth cardstock. I attached my Heart Tree panel to the ink blended cardstock then layered on top of a piece of Blu Raspberry Cardstock. 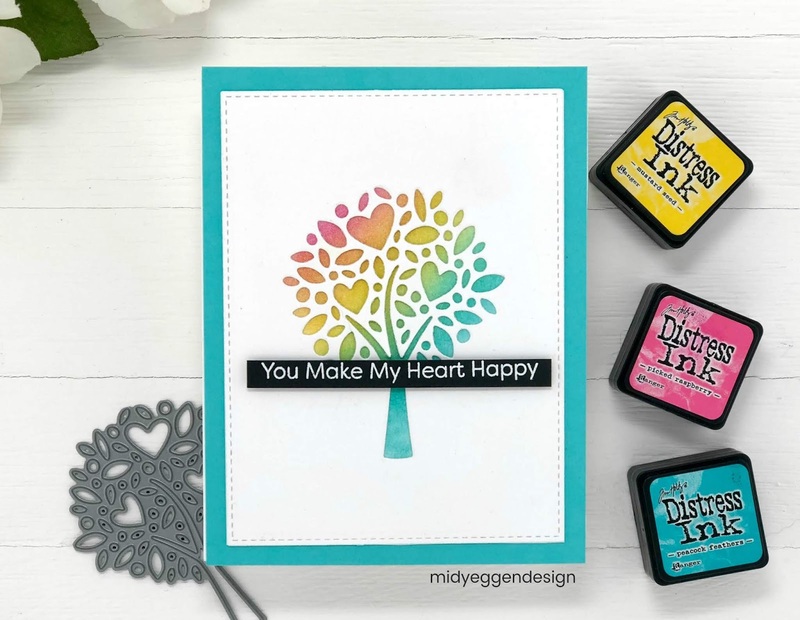 The sentiment is from the Tweethearts stamp set and heat embossed with white onto Black Licorice cardstock. I trimmed the sentiment down to a thin strip and added to the front with foam tape. My next card is featuring the Hearts Entwined Die. This is such a gorgeous die with endless possibilities. I started with creating a background by watercoloring Fossilized Amber, Picked Raspberry and Wilted Violet. I then sprayed with Shimmer Spritz for lots of sparkle! The Hearts Entwined I die cut two times from white cardstock and once from white glitter cardstock and layered together for dimension. My water colored panel I trimmed down to 4″ x 5 1/4″ and added to a white A2 card base. Then I added my die cut piece. 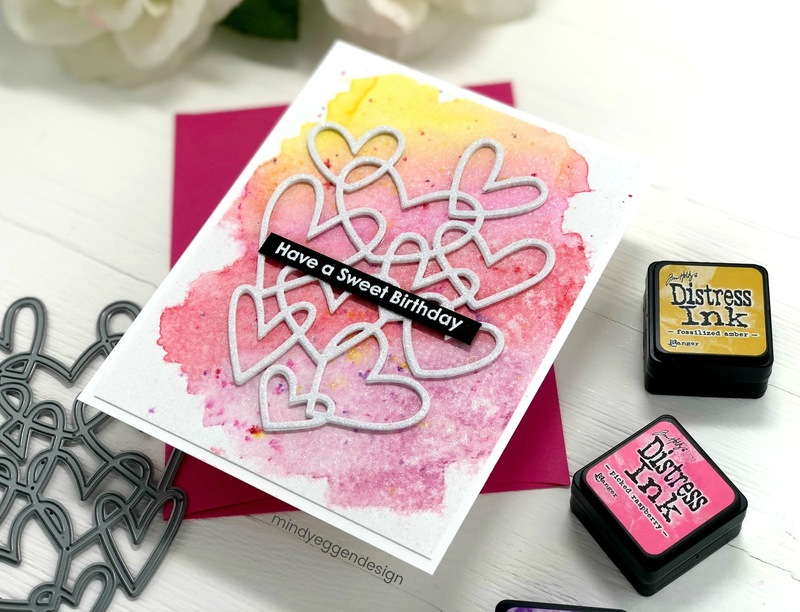 The sentiment is from the NEW Sweet Celebrations stamp set which I heart embossed with white embossing powder onto black cardstock and trimmed down to a thin strip. I then added to the front of my panel. I love how the black just pops off this card! 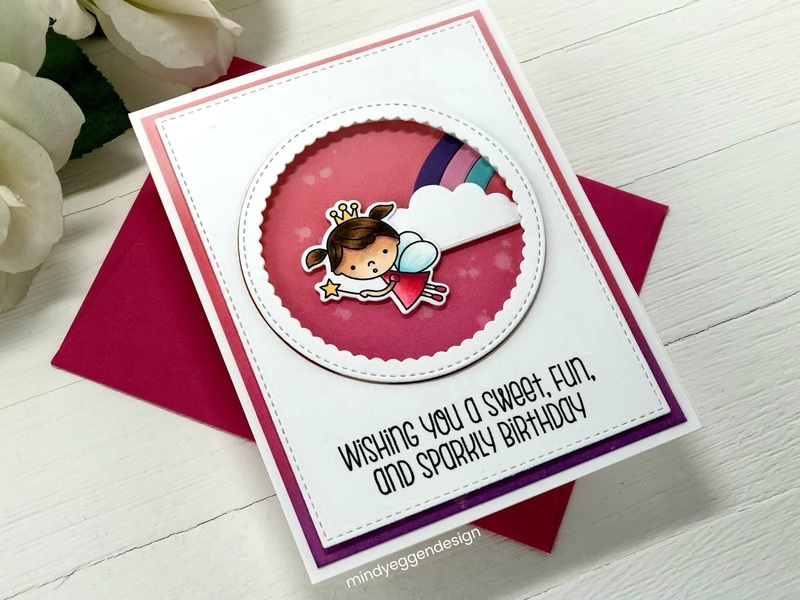 My next card is featuring the Rainbows and Unicorns stamp set. This has some adorable images and sentiments on it. I focused on the cute little fairy princess. I stamped her onto Neenah Solar white cards with MFT Extreme Black Ink. Then colored with copic markers and die cut with the coordinating dies. 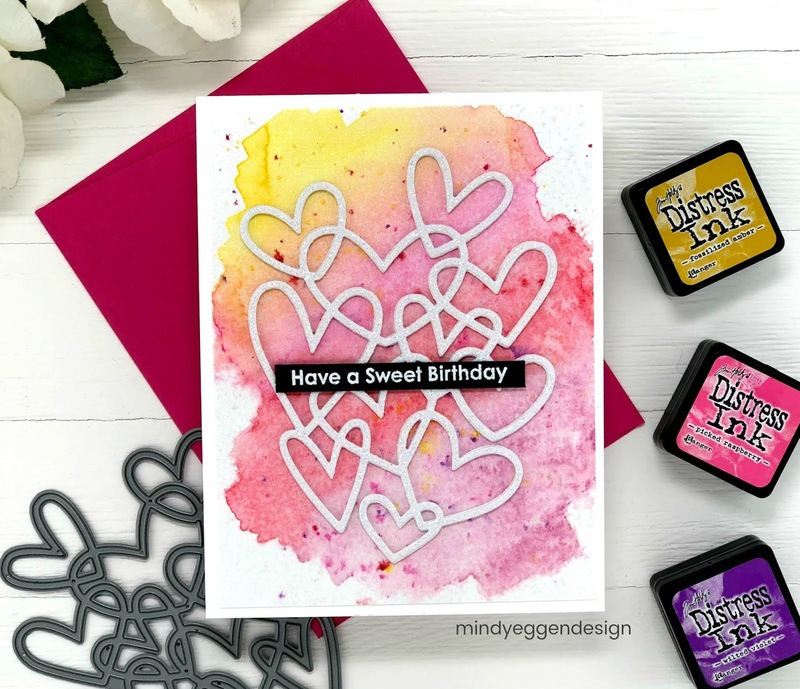 On a piece of Tickled Pink cardstock I ink blended, Picked Raspberry and Wilted Violet Distress Inks. I trimmed this down to 4″ x 5 1/4″ and added to an A2 size notecard. Using a piece of white cardstock I die cut a front panel using Blueprint 29 Die-namics. Then I die cut a circle using the Stitched Circle Scallop Frame. I stamped my sentiment from the Rainbows and Unicorns stamp set at the bottom of this panel. I could then add this to the front of the card with foam tape. Next, I added in a rainbow from the new Once Upon A Rainbow and also added my sweet fairy princess. I adhered the circle frame back in by double layering some foam tape. 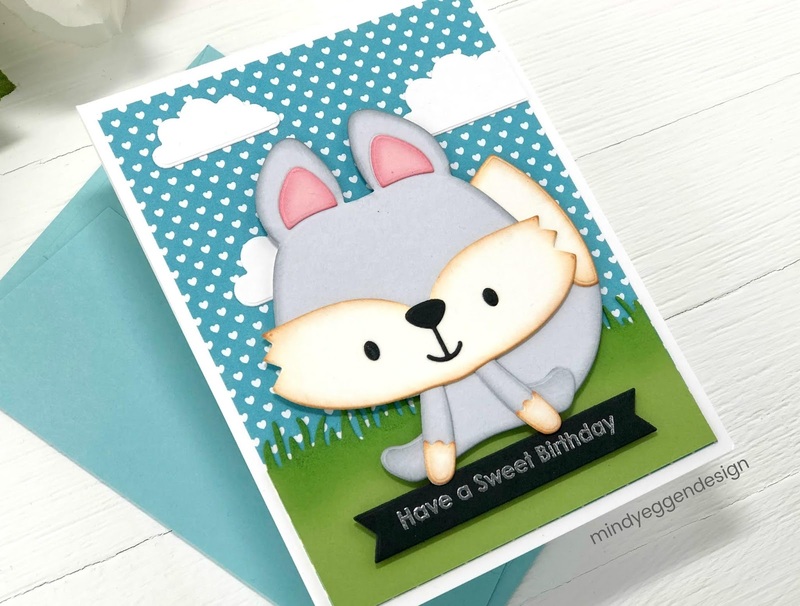 Last card to share with you is using the new Friendly Fox Die-namics. 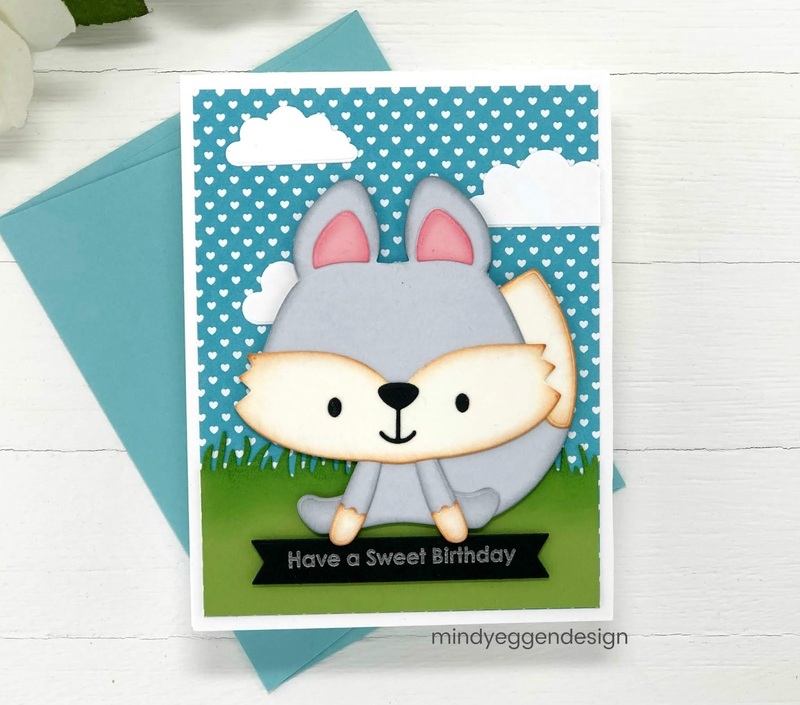 I went a little more non-traditional and die cut pieces from Cement Gray, Classic Cream, Cotton Candy and Black Licorice cardstock, I used some Colorbox chalk ink around the edges to give my critter a little more character. This critter is super simple to put together. When you are die cutting the pieces it also lightly embossed outlines of where the legs line up and eyes/mouth go which makes it quick to put together. For my background, I’m using the new paper pack Sweet Stack. I added a few clouds from the Once Upon A Rainbow Die-namics and grass at the bottom with the Grassy Edges Die-namics. My sweet critter is added to the front using foam tape for a little dimension. 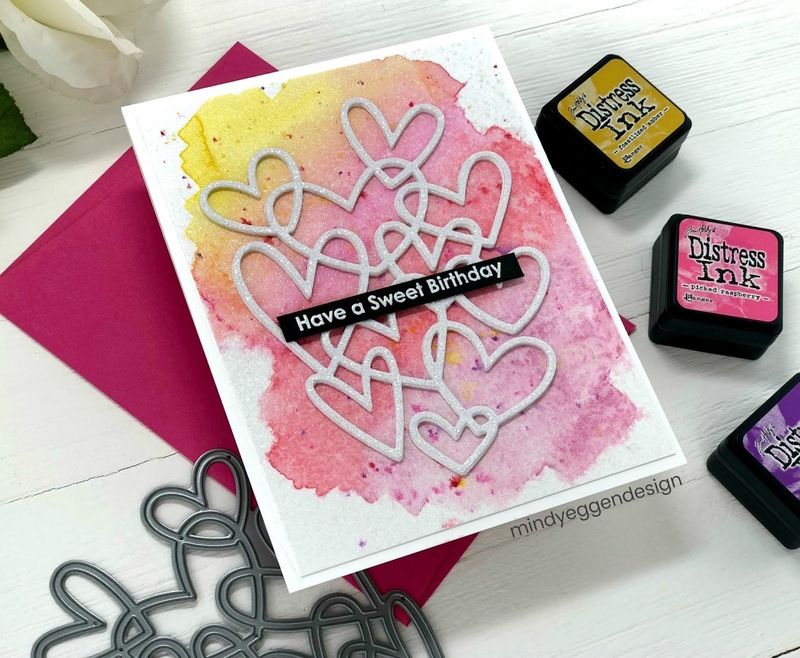 For the sentiment, I used a birthday sentiment from the Sweet Celebrations stamp set. I heat embossed with Silver embossing powder onto black cardstock then trimmed down with the Fish Tail Die-namics. This is only the tip of the iceberg of what was released today so be sure to head to the MFT website to check it all out. So much cuteness! Seasons Giving Blog Hop Winner! All of your cards were lovely. My favorites were the tree, loved your ink blending, and the little fox. Thanks for sharing. Wow! So much to love! I especially love that pastel rainbow of colors in your tree with hearts in it! So much cuteness indeed, Mindy. These are all adorable, its definitely a great release. Your cards are fabulous. I love your use of color. Wow, all of your cards are amazing. Your inking is fabulous. Such a fun range of cards that beautifully showcase these products. Thanks for sharing your creativity. Fabulous card! Love that beautiful tree design and the colors you used! Awesome die! Gorgeous cards! I love how you used the Distress inks to color the background in the first and second card.